Pardon My Franglais! : Nothing could Rouen our day! Nothing could Rouen our day! Knock on some wood ... (Je touche du bois) but I want to say the bad luck has (finally) run out! I did some deep thinking and I believe it began Thursday when we left coats and scarves at the club, therefore I was thinking Thursday things might turn around ... and I really think they did! We rendez-vous-ed for dinner (the 24 hour time still gets me, I thought I had 2 more hours to lounge) and went to a sushi place suggested by one of the professors of the program. It was v good and there was a petit chien dans un sac - a little dog in a bag. Then we were craving something sweet, as we often do in Paris and after a frightening trip to the ATM (flashback to the card being eaten, and it was taking a wicked long time to read the card a second time) we made it to our Monoprix préferé. There was nothing that special about the evening but there were lots of laugh with good friends - very much needed before the Paud split again for the weekend, some jetted off to Prague and the rest held down the fort here. The next morning. je me suis reveillée très tôt, I woke up very early. We had to be at the bus at 8 for our excursion to Rouen, but I wasn't complaining because this little Parisian used to be obsessed (might still be?) with Joan of Arc! Plus, whenever I wake up wicked early here, I can still text my friends and family back in the states which was an incentive. Rouen was so cool! 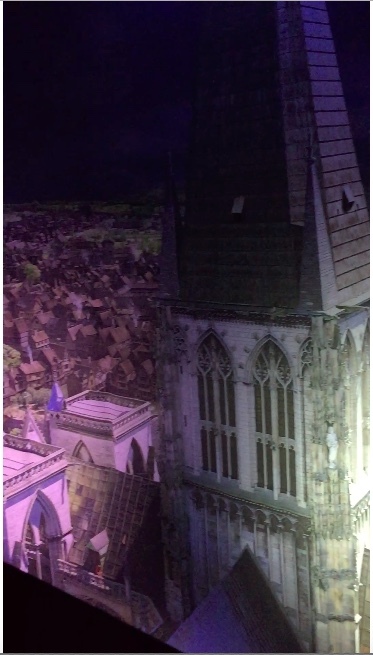 Our first stop was an giant (empty) water tower that was transformed into a 3D panorama picture of Rouen in Gothic times. The lights and sounds make it seems like time is really passing so it felt like we spent 3 days in that water tower. Next nous avons fait une petite promenade au centre-ville de Rouen, we went on a little walk to "downtown" Rouen to check it out during out temps libre and also find something to eat! We walked on the little cobblestone streets and it really felt like something out of Beauty and the Beast. We also saw le Gros Horlage or the Big Clock that Rouen is famous for. Lunch was a croque monsieur et une café noisette which hit the spot and my craving for a croque. After lunch, we walked around some more and took a bunch of pictures (and in the process I was frantically deleting old pictures and apps to free up storage - it's a constant struggle folks, and happens every trip). Then we found l'Église de Sainte Jeanne d'Arc or Joan of Arc's Church - obviously not her own church when she was alive (the theme of this trip was ... et il n'existe encore or it doesn't exist today). It was cool to see a modern church and also see the spot where she was burned at the stake (or at least the sign that told us). what a hip, new church! Then we ran across town (which took us a grand total of 5 minutes) to .... another cathedral! But first was a visit to a bizarre museum, history tour of the life and death of Joan of Arc - so again, no complaints over here (except it was quite long and also v strange). 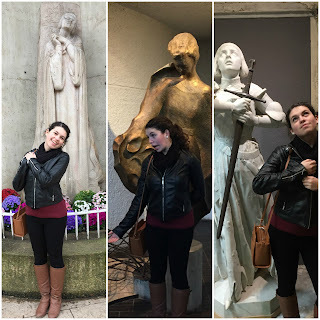 Lots of pics, including me posing in front of literally every Joan of Arc statue I saw. I really should consider a career in modeling ... after all it is Fashion Week over here! Then we popped in the cathedral for a second and I could have sworn we were back in Reims, because they literally looked the same. We wandered around town a little more, back on our favorite road which we probably walked back and forth on like 8 times (honestly an underestimate). Quatre (4) Fromages? Quatre reasons to say OUI! Could never be truf-full of this pizza! Dinner was Indian - there's a first time for everything and it was delish to say the least. Oh la vache! - Holy cow! Oh la vache! Nous avons eu une semaine très interessante! Holy Cow! We've had a very interesting week.